Here is a photo of what I think is a Tilling Stevens Express, the body seems to be a Plaxton D2 pattern job which would date it to the late 1930s early 40s. We did a partial reframe of one – ugh, never forgotten the back was rotten where the sunshine roof drains had long since perished. But if the chassis is an Express then this would surely be a rebody I think. At the time of the photograph this vehicle is being operated by R. Preston on, I suspect, miner’s contract work, the condition is about right for miner’s trucks. I don’t think for a second that the vehicle was new to R Preston but I have no history of its earlier life. 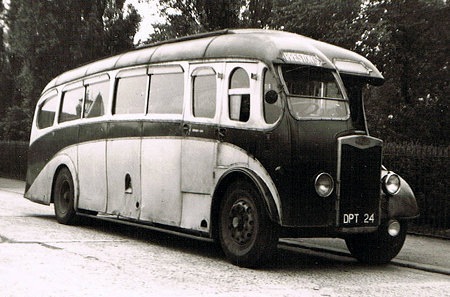 The Durham registration DPT would date this bus to 1938. The radiator shape, slightly narrower and shorter than the post war variety (which was also slightly curved), suggests that this is probably a petrol engined H39A7 vehicle that was produced from about 1935 up to the cessation of wartime production. The body I cannot identify for certain, but it has definitely seen better days than the one on which the photo was taken. I’m pretty sure that this is a Plaxton D3 body. In the Venture Publishing book on Plaxton by Stewart J. Brown, there is a picture of an unidentified D3 on a Leyland Tiger chassis which has all the same features – including the distinctive, heavily arched cab and emergency door window tops, window layout, side flashes, and of course the characteristic shape of the destination boxes. It states that the design appeared towards the end of 1937. TSM HA39A7, chassis number 8801, new in 5/38 to Coulson, Rushyford (part of the ABC consortium until 1946) with Plaxton C32F body. Passed to Preston, Ferryhill in 1948 and withdrawn 6/54. (Source: PSV Circle publication PA1: Durham District Services).